Cerkl is here to make you work smarter, not harder. In order to help you parse through your content and data we have included filtering and search bars throughout the platform. That information is just waiting for you to find all of its Insights. The best ways to quickly track down the relevant information for you or your organization is to use custom dashboards and filters. Built into nearly every chart or graph is a custom Filter button (the one that looks like a funnel). The filter button is dynamic, meaning that it changes depending upon what the graph contains. So if you're looking for subscribers from a specific organization who have personalized and then sort it by opens - you can do that. If you would like to see how content is doing from only one category - you can do that as well. The filter button also contains actions like how to export to a CSV, read more about that here. Filtering is also heavily used within the Content Manager. 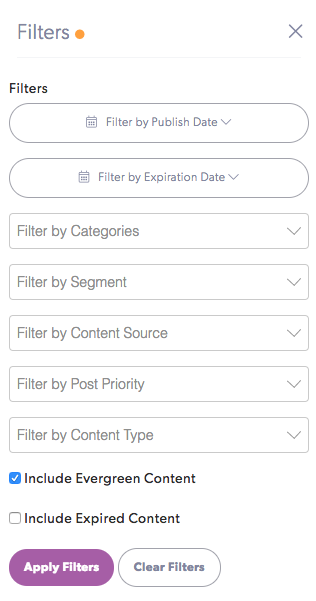 You can sort through all of your scheduled content by Type, Source, Publish/Expiration Date, Priority, Segment, or Category. It is also how you can track down your expired content to recycle it.